Since the adoption of the Americans with Disabilities Act of 1990, cities and communities across the country have been revising and improving their modes of public transportation to better assist people with disabilities who want the freedom and independence to travel throughout their own community. Baltimore is no exception. 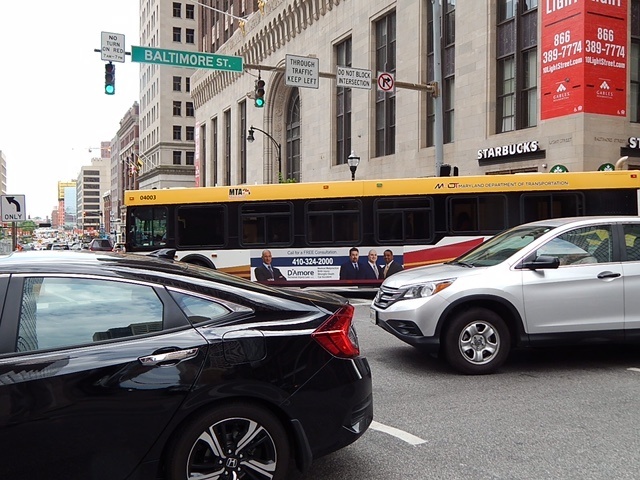 On June 18, 2017, Baltimore MTA will launch its new BaltimoreLink, a complete overhaul and rebranding of the core transit system operating within the city and throughout the Baltimore region. Senior riders and those with disabilities can receive comprehensive training so they are able to use this new system safely and independently. Maryland Transit Administration (MTA) offers various modes of transportation, all of which are wheelchair accessible and allow service animals to accompany passengers with disabilities. Local Bus currently has 57 bus routes, including 4 routes with limited stops and 4 express routes that operate from various suburbs to downtown Baltimore. Commuter Bus links our suburban areas as far south as California, Maryland, and as far north as Hagerstown, Maryland to Baltimore and Washington, D.C.
MARC Train uses the Camden Line and the Penn Line to connect Baltimore to Washington, D.C.
Light Rail runs north and south connecting BWI Marshall and Hunt Valley, Timonium and Cromwell, and Penn Station and Camden Yards. Metro Subway runs east and west from Johns Hopkins Hospital to Owings Mills which has various local bus connections along the way. Mobility/Paratransit is transportation provided to those who are functionally unable to get to a bus or station stop or who are unable to board and ride a bus or train by themselves. It is available within a 3/4 mile of any local bus, light rail, or metro subway stop. The cost is only $1.90 one way per person. The MTA also offers a trip planner and My MTA Tracker, which sends you real-time alerts either by email or text. This service is available to MTA-certified Mobility customers who meet the eligibility requirements. It is a separate service from the Mobility service in that the MTA contracts with local taxicab and sedan companies and individuals who participate in this program deal directly with these taxi and sedan companies. Should you need assistance or use a foldup wheelchair or motorized wheelchair, let the company know ahead of time. People in this program are allowed 2 trips a day at a cost of $3.00 per trip. The MTA will pay up to $20.00 for each trip; if your fare is over $20.00, you will be responsible for the $3.00 plus any amount that exceeds $20.00. If you travel with a personal care assistant, their fare is free. The Call-A-Rideservice covers the same area as MTA Mobility, which is Baltimore City, most of Baltimore County, and some of Anne Arundel County. Let’s face it: Making the necessary arrangements prior to visiting a local attraction in Baltimore is a good rule to follow no matter who you are. Proper planning ahead of time will help to ensure that your trip is more enjoyable for you and others traveling with you. If you are going to be taking additional items, such as strollers, motorized scooters, or service animals, call ahead. Although facilities have accommodations for these types of items, they may provide additional assistance or services that aren’t normally advertised. If you’re visiting a museum or historical site, contact the facility as they may be able to advise you on the best area to park in and what entrance will provide the easiest access for you. They may even provide curbside service or drop-off. Most public locations provide maps of their location on the internet. If you are unable to find one, call the location, as they may be able to send one to you by either email or mail. Mapping out a plan will help you decide ahead of time which attractions you want to see and in what order. It will also show you where the handicap accessibility points are in the buildings and whether there are elevators or escalators. Should you be traveling by public transportation, you may be able to judge the distance from your stop to the building. The travel industry has realized that the people with disabilities are increasingly traveling, and facilities are providing more services and accommodations for those travelers with special needs. With that being said, accessibility regulations vary from country to country. Below are a few trips if you are planning a trip abroad. Make Your Reservation: Be very specific and clear about your disability and the additional assistance you will require. Let them know exactly what you can and can’t do. This will help them better accommodate you once you arrive. Talk to Your Doctor: Advise your doctor of your travel plans. He/She may be able to advise you on the limited medical facilities and provide you with additional prescription medications you may need. You will also want to get a note on the doctor’s letterhead that sets out your conditions, medication(s), specials needs, and other pertinent information, along with the doctor’s contact information in case of an emergency. Bring Spare Parts: Wheelchairs, although durable, can take a beating when traveling long distances. Take a spare parts kit and tools for any emergency repairs. Know Your Rights: Review TSA Rules for travelers with disabilities and medical conditions. You may also want to review the U.S. Department of Transportation’s Air Carrier Access Act, which includes definitions of the rights of passengers with disabilities and the obligations of airlines. Over the past few decades, we have broken down a lot of barriers for those who require additional assistance. Yet that’s not to say we don’t still have a long ways to go. Being flexible and having a positive attitude should not be confused with settling for less. Remember that, when you are traveling, whether across the ocean or within Baltimore, if you believe your rights are being violated, speak out and work toward remedying the situation so the next traveler won’t experience the same frustration.